FMM continues to attract celebrities and personalities both locally and from around the world, sometimes for business but, more often than not, purely social visits. Over the Festive Season, the museum hosted a number of well-known individuals including Tschops Sipuka, the first black South African Motorsport Champion who went on to represent his country at international championships. Born and bred in Qumbu in the Transkei, Batshobonke Sipuka, aka Tschops, enjoyed a racing career that spanned seven years, from 1998 to 2005. 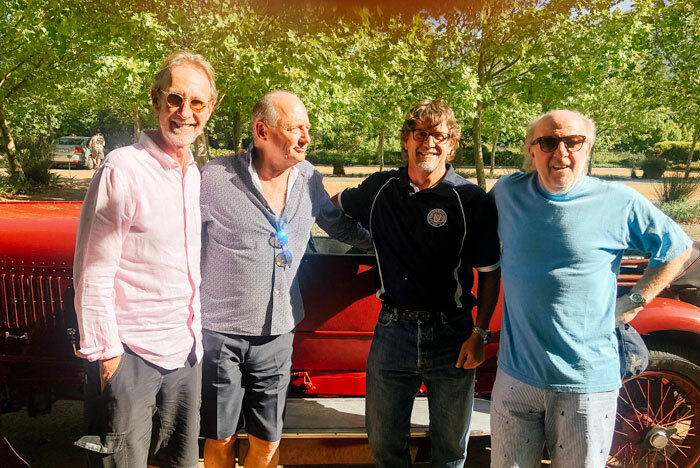 Then in mid-January as guests of the Rupert family, a star studded group arrived comprising of ex-McLaren boss man Ron Dennis and his partner Carol, ProDrive chairman Dave Richards and his wife Karen, plus English songwriter and musician Mike Rutherford and his wife Angie. British businessman Ron Dennis CBE is best known for his former role as owner, CEO, chairman and founder of McLaren Technology Group. Between 1981 and 2009, Dennis was the team principal of the McLaren Formula 1 team, and was instrumental in transforming the outfit into a regular world championship contender. Constructors’ and Drivers’ world championships were won with Niki Lauda, Alain Prost, Ayrton Senna, Mika Häkkinen and Lewis Hamilton. His 37-year association with McLaren ended in 2017. Aside from McLaren interests, Dennis is also one of six British business persons to become an official British Business Ambassador for advanced engineering and manufacturing. He is also a main trustee for Tommy’s, a miscarriage help charity, is the Global Consultant for the state owned China Minsheng Investment Group and also the chairman for the UK Summit. With interests in foreign trade, Dennis also became Chairman of the British East Asian Council in 2014. Before the merger with Louis Vuitton, Dennis was a major shareholder in the luxury watch maker TAG Heuer. Richards is the chairman of Prodrive, chairman of Motorsport UK (The Royal Automobile Club Motor Sports Association Ltd), former chairman of Aston Martin, and a former team principal of the BAR and Benetton Formula 1 motor racing teams. He lives with his wife, Karen, in Warwickshire and has three children. In the 2005 New Year Honours List, he was appointed a CBE for his services to motor sport and in 2017 was inducted into the Motor Sport Hall of Fame and received the Spirit of Le Mans award from the Automobile Club de l’Ouest (ACO). Rutherford is a founding member of rock band Genesis and one of the rock band’s only two continuous members. Initially serving as Genesis’s bass guitarist and backing vocalist, Rutherford also performed most of the band’s rhythm guitar parts, frequently on 12-string guitar. In addition he was one of Genesis’ main songwriters, and as a member was inducted into the Rock and Roll Hall of Fame in 2010. 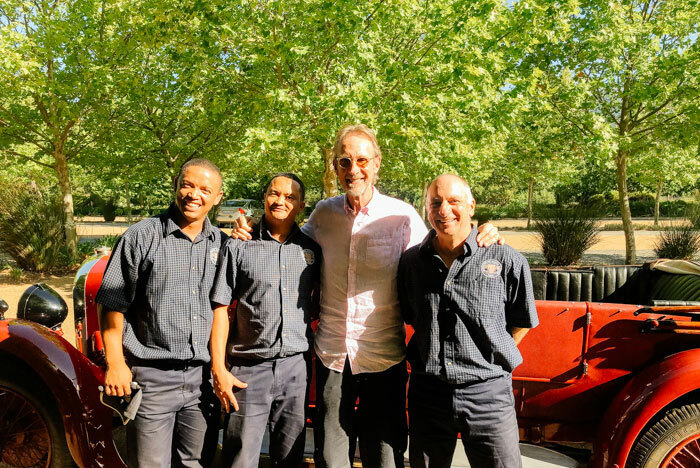 In 1985, he formed the highly-successful band Mike and the Mechanics, which became a chart-topping act and significant live draw in its own right. 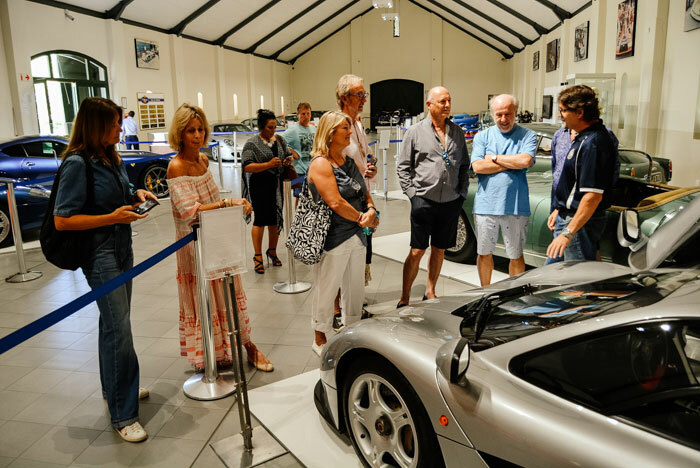 Rutherford’s interest lie more with horses and cars but the group thoroughly enjoyed being shown around the FMM collection by curator Wayne Harley, and were later driven to wine-tastings at Terra del Capo on the L’Ormarins Estate in some of the museum’s vintage machinery. A relaxed, friendly and enjoyable visit for all concerned. Above: Mike Rutherford, Ron Dennis, Wayne Harley, Dave Richards. Above: Wenstley Wicomb, Wilfred Tarentaal, Mike Rutherford, Lorenzo Farella. Above: Dave Richards and wife Karen. Above: Ron Dennis and partner Carol. Above: Mike Rutherford, Ron Dennis & Dave Richard with museum currator, Wayne Harley.